SNES Prince of Persia 2 (USA) in 11:11.94 by Alyosha. 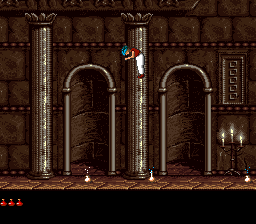 The SNES port Prince of Persia 2 is generally regarded as a bad port of a very hard platforming puzzle game. The controls are clumsy, the puzzles are seemingly random, and the player dies very easily. The port also leaves out the last level. Fortunately there is a major bug in the game that allows large parts of it to be skipped. This run follows the same general path as nitsuja's run, but saves time by fixing some mistakes and better enemy manipulation. Overall about 4 seconds are saved in gameplay, but the movie is still 12 seconds longer due to more accurate emulation.